Exclusive: 1974 Canadian Electors’ List Named Ted Cruz’s Parents – Only Canadian Citizens Can Vote in Canada! Exclusive: 1974 Canadian Electors’ List Named Ted Cruz’s Parents on Voter Lists. Only Canadian Citizens Can Vote in Canada! Mother on Elector’s List Indicates She Possibly Declared Herself to Be a Canadian Citizen. Thus It Appears That Ted Had a Canadian Citizen (born Cuban) Father and Possibly Canadian Citizen (born U.S.) Mother Too. A Thorough Investigation by Congress of This Matter is Called For. Ted and the Cruz Family Must Open ALL Canadian Records for Scrutiny. Let’s See Ted’s Consular Report of Birth Abroad (CRBA), if Ted Has One, which is Used to Perfect the Claim of U.S. Citizenship for a Child Born Abroad. We Cannot Sweep This Under the Rug Like was Done for Obama’s Lack of Constitutional Eligibility. We Have Plenty of Constitutionally Eligible Candidates. Ted Cruz is NOT one! 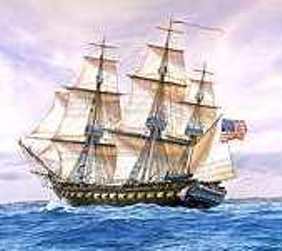 Ted Cruz Admittedly Being Born in Canada is Pushing the Eligibility Claim “A Bridge Too Far” and He Cannot Constitutionally Serve in the Oval Office as President and Commander-in-Chief — No Matter How Much One Likes Him or Not! 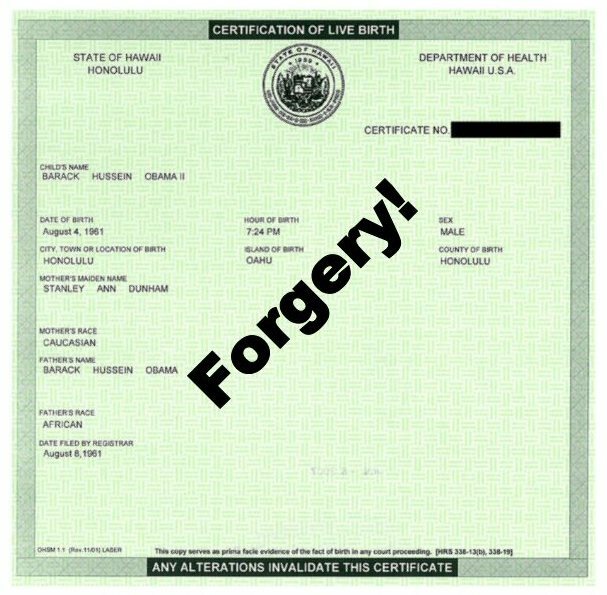 A Lump of Coal for Obama’s Christmas Stocking via the Wash Times – 3rd Week: Obama’s Selective Service Draft Registration Form is a Back Dated Forgery! A Lump of Coal for Obama’s Christmas Stocking via Wash Times! 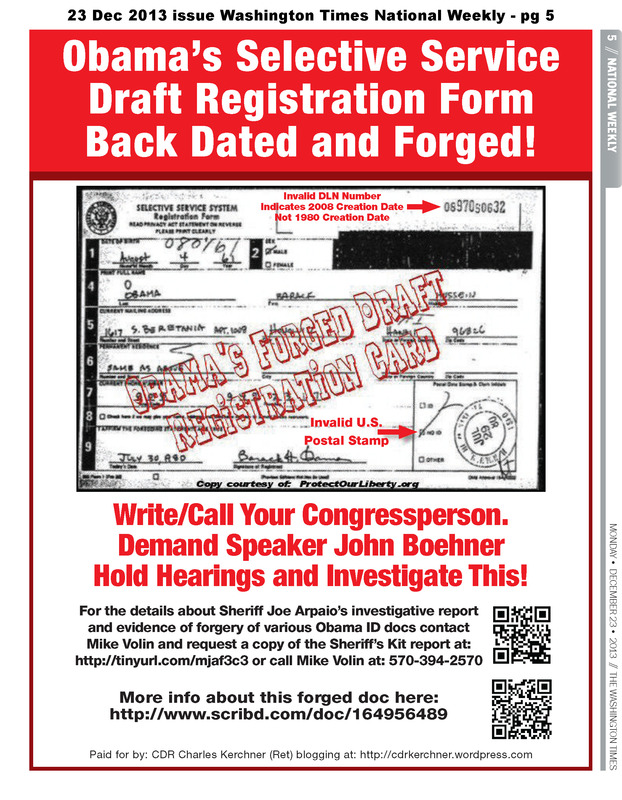 Download a copy: http://www.scribd.com/doc/193305667/Washington-Times-Ad-3rd-Week-Obama-s-Sel-Service-Draft-Reg-Form-Back-Dated-Forged-23Dec2013-Demand-Speaker-Boehner-Act Print this ad and send it (and/or send the link) to your friends, associates, email lists, and elected officials. 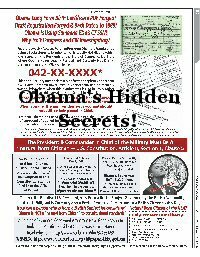 Obama the Enigma: Click on image to learn more about Obama he does not want you to know. Greatest political fraud in U.S. history. 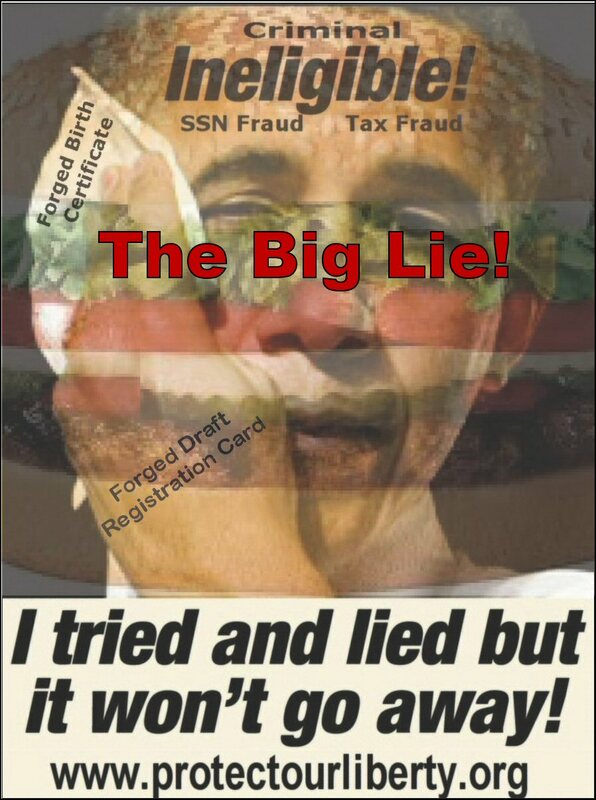 Click on image for evidence about the fraud Obama – The Big Lie! 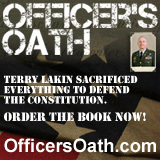 Author cfkerchnerPosted on December 23, 2013 December 30, 2013 Categories AdsTags AZ Sheriff Joe Arpaio, Barack Obama committing criminal ID fraud for decades, CDR Kerchner (Retired), Chief Investigator Michael Zullo, cold case posse, Congress must investigate Obama ID fraud, Constitution, DLN Number, draft, draft card, eligibility, fraud, Grave national security threat, Illegal, John Boehner must stop blocking investigations, kerchner v obama, lump of coal, Mike Volin, natural born citizen, Obama, Obama's Christmas Stocking, president, Selective Service, Sheriff's Kit, Speaker John Boehner2 Comments on A Lump of Coal for Obama’s Christmas Stocking via the Wash Times – 3rd Week: Obama’s Selective Service Draft Registration Form is a Back Dated Forgery!